We are currently pitching for a large private residence (approximately 2,000 m²) on a huge plot of land, 7 rai (11,200 m²) located in the province of Nakhonnayok. 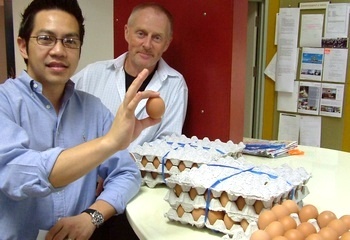 The family runs one of the preeminent poultry businesses in Thailand and is acknowledged as a major supplier of eggs. We have an excellent chance of winning the job as the initial meeting with the client was very positive and our design team was able to achieve all the initial client requirements. The good news is that there is a generous budget for this project, but the bad news looks like we might be paid in eggs.